On the basis of their 2015 release ‘Telephone’, Always Sick really deserve some attention. They show a very professional approach throughout each of the four featured numbers, while the material has a production value that’s equal to most of those great Lookout! Records releases of yore in that it’s reasonably polished while remaining just raw enough to please the DIY crowd. The best of the bunch, ‘Me vs. You’ kicks off with a great Johnny Ramone inspired riff before dropping into some tough staccato riffage during the verses. The bass and drums rarely do anything too out of the ordinary but both always retain a strong presence, while an accented and slightly husky vocal delivery gives the tune a strong melody and confident air. In under two minutes, you’ll get a truly classic riff – as familiar as so much punk you’ll know and love, but never the worse for that – as well as a great melody and a sugary, sunny hook. Factor in a slightly discordant solo and a coda full of brattish, surf-inflected melodies straight out of the Joe Queer school of composition and you have something approximating a sure-fire classic. ‘Me vs. You’ could well present Always Sick at their best, but it’s not that the other three numbers are in any way substandard. With gang vocals meeting a solid bass drum sound, ‘Baby, Please’ sounds like a homage to Riverdales, before a trashy guitar part steers things into Vandals-esque territory. Again, this is absolutely tight with a strong focus on a vocal melody, but it’s a ringing lead guitar that’s left with the unenviable job of linking everything that (somehow) makes the most indelible impression. The increased use of gang vocals during the title cut makes it a dead ringer for Pinhead Gunpowder’s ‘Jump Salty’ material – it’s entirely possible to imagine Billie Joe Armstrong and Sarah Kirsch (RIP) harmonising without thinking too hard. While very much a vocal piece, under the shouty bits a solid guitar riff really motors, thus adding an essential melody near enough throughout. Blending classic nineties punk-pop with a more modern emo touch, ‘Wake Up!’ recycles all of the previous elements with a fatter guitar tone and a brilliant rattling bass line. A brattish tone on the chorus lends everything a huge amount of gravitas with a near perfect union of music and lyric, leading to a punky sing-along that really shows off this band’s talents. 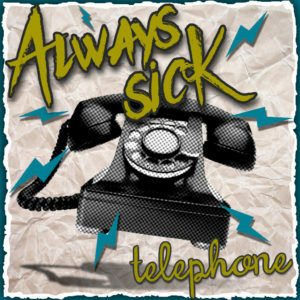 At just four songs and less than eight minutes it’s all over in a heartbeat, but even so, this EP captures Always Sick’s musical manifesto in a near faultless style. They’re instantly preaching to the converted with their tried and tested style, but fans of Ramonescore sounds shouldn’t miss this. …And It’s available FOR FREE via the link below. This entry was posted in Album & EP Reviews and tagged always sick, free download, punk, ramones, russia, stream by Real Gone. Bookmark the permalink.